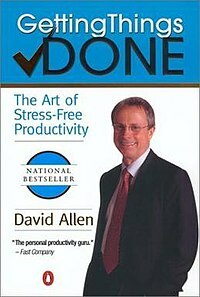 Getting Things Done™, or GtD, is a very popular approach to managing work created by David Allen. In this post, I’ll describe the essence of GtD, followed by an overview of Kizby, and finally describe how I use Kizby to implement GtD and highlight features that I think make Kizby shine in a GtD-style workflow. Capture everything, somehow, in a systematic way so that (i) you don’t have to remember it and, (ii) you no longer have to worry about whether you’ll remember it. This is your system. It has to be systematic so that you can trust that once information has been added, it can be found again. Review the contents of your system on a regular basis both to remind and realign with changed priorities. This review can be thought of as grooming. Your system minimally needs a projects list to record the things you want to accomplish, a calendar for reminders, and some kind of filing system for accessing reference materials. There’s no technological requirement: GtD is often implemented using just a paper and pen! Of course, tools like Kizby can help automate tedious aspects. Capture everything that you feel you want to remember or do into one or more in-baskets. Periodically process your in-buckets to decide what to do with those items (e.g., discard it, file it as reference, or defer it). If it’s something do be done, describe the desired outcome in a single sentence. Then determine the small discrete steps required to move towards that outcome (the “next actions”). Organize the results from processing: add reminders to your calendar, incorporate projects and tasks into your projects list, and/or file away reference materials into your filing systems. Review your projects list for work to be done. The key to GtD for many is the review stage. Rather than being an occasional affair, GtD advocates at least weekly reviews. This ensures that you remain aware of what’s going on, and can dodge and weave as your situation changes. I should note here that I do not consider myself a GtD purist, and more dogged or dogmatic adherents may take issue with this summary. If you’d like to learn more, I’ll refer you to David Allen’s book and the many available overviews of GtD (e.g., 1, 2, 3, 4). There’s also a useful Yahoo! Groups forum; it can be a bit high-volume at times, but there are many interesting insights shared by participants. Kizby is a new desktop-based project and task management tool for Windows, Linux, and MacOS X. Kizby “rescues your task list” by combining the strengths of a project planning app for managing the big picture, a todo list for breaking down work, and a notebook for capturing everything else such as notes, journal entries, links, related files, emails, and other information associated with a project. Kizby is a hierarchical project management tool. This simply means that Kizby groups tasks by project as compared to a flat list or a set of flat lists. Projects can have sub-projects to whatever depth is useful. Kizby’s projects are very lightweight: you can create as many or as few as you need. To manage having many projects, Kizby supports assigning meaningful states to projects and tasks to describe their status such as Ready, In Progress, Blocked, Waiting, Cancelled, or Archived (complete list). By assigning project states, you can quickly filter projects to just those that matter now. As you’ll see in the following screenshots, Kizby supports recording a rich set of metadata about projects and tasks that can also be used for filtering purposes. Rather than provide an in-depth summary of Kizby, I’ll highlight two principal perspectives, the Dashboard perspective and the Planning perspective. If you’d like to see more of Kizby, there’s a good overview in the Step By Step Tutorial with Kizby, and full detail in The Kizby Guide. Kizby’s Dashboard provides a cross-project overview of your available tasks. It features a nice set of built-in queries to allow quickly reviewing work that’s happened, as well as work that’s been scheduled for the future. It also provides quick visual summaries as coloured bubbles to indicate the number of tasks that are overdue (coloured in red), or active (blue-grey). The queries in the Today category are very useful to see what tasks you should work on today. It provides queries for listing the tasks starting today, that are due today, the tasks that are ongoing (i.e., those whose start date has past), and tasks that are overdue. The queries in the Upcoming category are useful to see what tasks are coming up for the rest of this work week and next week. The queries in the Upcoming category are useful to see what tasks were recently completed. The Changed Today query shows the tasks that were modified today. The tasks shown can be further filtered by state, priority, context, or location. The Dashboard is where I live on a day-to-day basis as I’m working. The planning perspective provides for more traditional project/task planning. The perspective defaults to showing current projects, meaning those projects that are not marked as being completed, abandoned, or cancelled. The Planning perspective is where I contemplate as I do my weekly reviews. I create new tasks, mark off any that are obsolete, and use drag-n-drop to create dependencies. I can use Kizby’s powerful filters to hide or reveal tasks and projects that are in certain states (e.g., to see the blocked tasks). How do I use Kizby as part of a GtD-inspired system? Perhaps the first thing to note is that Allen doesn’t insist on a single tool/device/thing for capturing and organizing. He only advocates that you have a systematic approach so that nothing falls between the cracks. I use a few tools as part of my system in addition to Kizby. I use a calendar program, iCal, but only to record appointments. I also use my email app, Mail.app, as an in-basket: if I find items or things that seem useful, I email them to myself at a special address. Kizby, of course, serves as my main project list. I try to create small focussed projects with well-defined goals. But I also maintain some checklist-style projects to correspond with the different contexts in my life (see below). I use these projects to act as catch-all locations for tasks that don’t warrant being projects in their own right. I break tasks out out as projects when required through Kizby’s nifty Transform to Project wizard. Rather than stick reminders in my calendar, I capture reminders as tasks in Kizby. Many of my reminders are for following-up on some deadlines for other people. For example, I’ve had some hassle dealing with my bank; I set a task whose status is set to Waiting with a due date of when I’m expecting to hear back from the bank officer. If that deadline passes, Kizby pops it up as a bright-red reminder in the overdue query. Or if I’ve delegated work to somebody, I’ll set the status to Delegated and a start-date for when to follow-up and nag. I also synchronize my projects and tasks with Toodledo to serve as the online complement to Kizby for those times that I’m away from my computer. Tasks added from Toodledo without a folder are synchronized into a “Inbox (Toodledo)” folder. When creating a task, Allen recommends recording the context for the task — either the resources required for the task or the location of where the task should be performed. For example, “phone”, or “home”, or “internet”. This makes it easy to identify tasks that can be done at some particular place. I found these contexts were a little too coarse-grained for my needs and became overloaded. For example, I didn’t want to call the doctor from work where everybody could hear, nor did I want to make work calls when at home. So I ended up with “phone-work” and “phone-home”: the context encoded both the location and the sphere. Development to do with my work. Marketing to do with my work. For stuff to do with open-source work that I do. I distinguish this from Work as it’s not necessarily profit-driven. For stuff to do with my home life. This is for projects that are related to my parallel life as a researcher. I unfortunately haven’t had much time to pursue any of these projects of late. We have tenants, and had some early work to do to get the apartment into shape. I break out new contexts as I see the need. I’m not doing much volunteer work at the moment, but when I was I had a context for each group. I more recently merged these contexts into the single “Volunteering”. I then have locations to correspond to different places in my life, such as Office, Home, or Library. Kizby also supports tagging tasks and projects with user-specified keywords. Contexts, locations, and tags are inherited from their containing project. I also use Kizby’s journalling and notes as my primary filing system, recording interesting findings as journal entries, and summarized knowledge as notes. I used to use a personal wiki for notes and a simple (but loooong) text file as a log — it was useful, but I found the disconnect between the wikitext and the visual result to be disconcerting, and the need to use several tools made searching a bit of a bear. With Kizby I have this useful information a single place that can be searched. My weekly review takes place in two phases. First I review my various projects by switching into the Planning perspective. I use Kizby’s filters to consider the projects separately either by context or by their state. I “star” or flag my next actions so that the Dashboard’s “Starred” list contains my active working set for the week. I generally avoid setting start or due dates unless they are real deadlines: I find the artificial pressures they create are more of a burden than a help. I then switch to the Dashboard perspective. I use the Today and Upcoming queries to verify that the work I’ve starred is achievable. I then use the By State queries to review tasks that are marked as Blocked, Deferred, or Someday to see if they’ve become available. I combine the someday status with the due date to act as my tickler folder. When getting ready to work, I switch to the Dashboard perspective. The Today category shows me what I’m to work on: my planned tasks for the week (Starred), and the items that are to be started and finished this week. The Upcoming category shows me tasks that are either to be started or finished for this week. That, in a nutshell, is how I use Kizby to implement my GtD(-inspired) system. I’m currently managing about 40 projects, in various states, and over 400 tasks, and generally feel pretty in control. We’re always interested in hearing how other people approach their systems. Share your thoughts in the comments below! If you’re missing deadlines, or becoming stressed and frazzled in trying to manage your work, or frustrated with your current productivity tools, then you should give Kizby a try. Try Kizby for free for 30 days: no credit card details required. If you like Kizby, then we’ll be happy to start a subscription for you. Click on the “Free Trial” seal to get started. Getting Things Done is a registered trademark of the David Allen Company. This entry was posted in Guides, Kizby, Tips. Bookmark the permalink.